Food is such an important part of your holiday and is often not given the proper respect it deserves. For some, meal times are nothing more than an afterthought, a way to fuel the body, but for us food is the deciding factor between a good holiday and a terrible one. Dramatic food snobs? Us? Never. To make your next getaway truly memorable we’ve picked the brains of the (very local) experts at Visit Noosa to bring you the skinny on the absolute best eats, drinks and everything in between that the glistening shores of Noosa have to offer. Because let’s be real, if you’re anything like us you’re totally going to plan your trip around the food. Note pads at the ready—let’s do this! Hope you’re hungry. Breakfast is a huge deal in any foodie’s life, and a holiday can often mean separation anxiety from your favourite barista. Rest assured though, these brekky spots in Noosa will have you breaking the fast in the most delicious of fashions. Hand of Fatima is in Peregian Beach (a 15-minute drive from Noosa) but it’s well worth the jaunt. Dishing up Middle Eastern-style breakfasts and lunches, Hand Of Fatima can’t be missed. The Persian Rice Pudding is a game changer, likewise with the Moroccan braised beans. Don’t let the name fool you into thinking this is just some humble loaf shop—this place is everything. The croissants here will take your tastebuds on a journey to France and have you vowing to return to Noosa for breakfast every day for the rest of your life. The pain au chocolat is also amazing. P.S—this place turns into a French bistro by night, too! The Noosa Farmers Markets, held every Sunday are perfect exploring of a morning, and also for finding a delicious breakfast. Try the Sunflower Hotel smoothies while you search for your perfect breakfast. If you’re that much of a curry fan, the incredible array of Malaysian curries and roti totally count as a breakfast food. 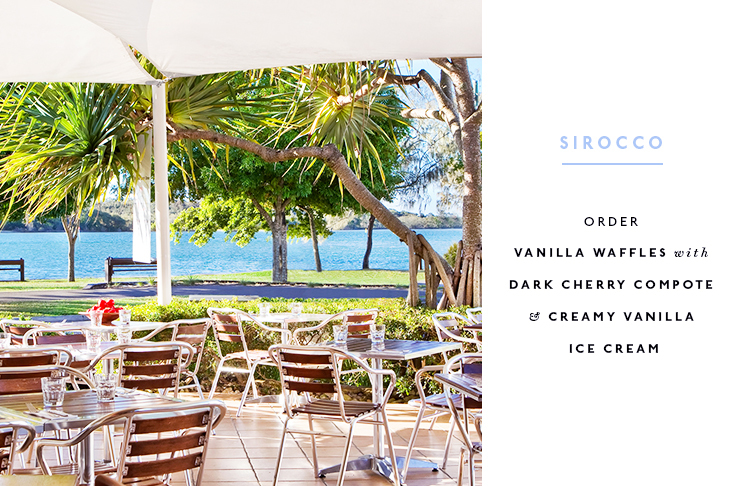 Sirocco sits by the water and boasts an incredible view, which is definitely the right way to start your morning. Order the grilled olive bread: halloumi, braised spinach, roasted mushrooms, tomato chilli jam, and harissa oil. If sweet breakfasts are more your gig, try the vanilla waffles with dark cherry compote and creamy vanilla ice cream. Season has one of the best locations for lunch in Noosa. Nestled right on the shores of Noosa Main Beach, these guys will serve you a delicious lunch and a killer view with a fresh ocean breeze. Try the spanner crab linguette, seriously—it will change your life. 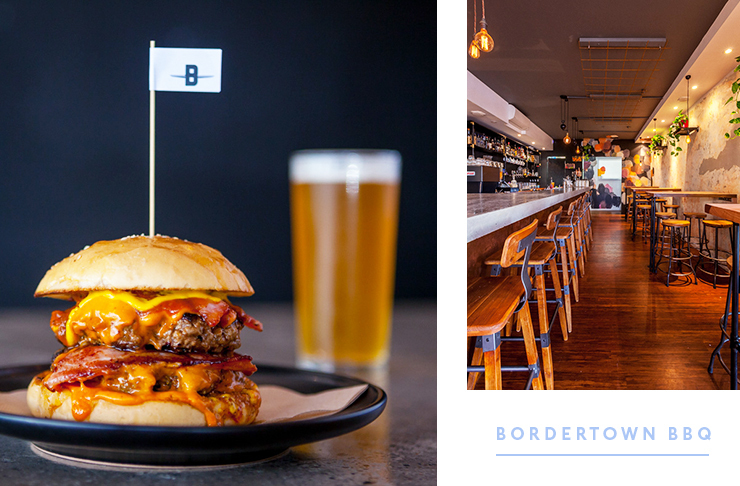 Bordertown BBQ is seriously good. Think fresh fish tacos, piled-high burgers, authentic Mexican everything and local boutique beers on tap. Plus, they make their own BBQ sauce, which is guaranteed to have you begging for the recipe. Embassy XO is in Sunshine Beach, which gives you the perfect excuse to explore beyond Hastings Street. Yum cha is on offer Fridays through Sunday and you’re going to want to make a booking—trust us. Thomas Corner Eatery know a thing or two about food, and it shows in their impeccable menu. Set up shop over a long lunch to shuck back oysters, or, try the barbecued cuttlefish—it's life changing. Dinner tastes so much better after a day lounging on the sand, doesn’t it? These spots are perfect to sate your appetite after a hard day of relaxing by the ocean. Cholo is a gorgeous new Mexican spot in Noosa Junction. These guys are worth a visit for their torta alone, but their margaritas will have you setting up shop here until long after the sun has set. This Italian spot is famous in Noosa for their next-level gnocchi. Their salami platter will also blow your mind, but honestly, everything on the menu is going to have you raving to your friends back home for months. Don’t forget to order an Aperol Spritz, too! Pitchfork is hands down one of the best restaurants in Noosa, so you better not leave it off your list! This spot is also at Peregian Beach, but is more than worth the trip. Plus, they’ve just started doing breakfast, which is major. If you must order one thing, make it the confit duck with goat’s milk yogurt. Or the fritto misto with battered fish, prawns and calamari. 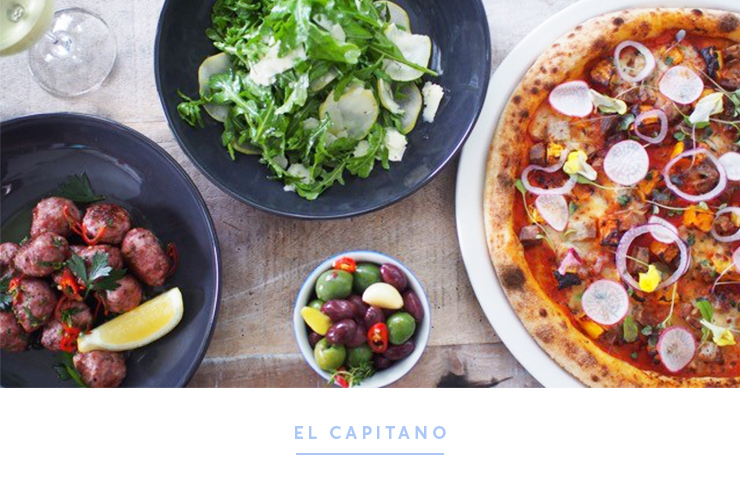 El Capitano know their way around a pizza or two. The slow-cooked lamb and goat’s cheese pizza is worth a trip to Noosa on its own. Make sure you check out their specials board as it changes daily and is full of cracking pizzas. Because being on holiday is kind of the only time it’s acceptable to go for drinks every night, these are the best places to throw one back. Moto has spades of cool, yet comes with the breezy chill vibes of Noosa, too. Moto is a motorbike showroom that also doubles as a café and bar 6 days a week. As if that wasn’t cool enough already, there’s also a pizza food truck that rocks up on Sundays. Village Bicycle is one of the best places to drink in Noosa! Expect good vibes, amazing food, and awesome people. Set amongst walls covered in impressive street art murals, there is poutine, there are Aperol Spritz, and there is plenty of fun to be had. For a no frills, relaxed vibe and cheap schooners, the Noosa Surf Club is second-to-none. These guys have unbeatable beach frontage, and have a seriously relaxed atmosphere that comes with being a true local. The Noosa Boathouse Sunset Bar is a hidden gem, and something local's aren't likely to let you in on this secret! Order the Noosa River Sling and a charcuterie board and soak in the holiday vibes. Not even holidays mean taking a break from coffee. To ease the separation between you and your favourite cafe, here are the best spots to grab a Melbourne-worthy coffee. Clandestino Roasters is Noosa’s biggest local roaster, so you’re bound to end up drinking their coffee anyway, but, their HQ sits inside Belmondos and is well worth a visit for the cool factor alone. Skal calls Peregian Beach home but is the perfect place to seek out when in search of coffee. These guys pour up Padre Coffee, and also absolutely nail a chia masala. Costa Noosa is in Sunshine Beach, but are an OG fave for Noosa locals. These guys have a huge sprawling deck, making this the perfect spot to set up shop with a newspaper (or your phone) and a coffee. Padre in Noosa is awesome. With clean, pristine white vibes it can feel a little like a laboratory, especially when they’re that good at coffee. Need even more to eat and drink? Check out Visit Noosa’s website now and get planning. See you there! Image credit: Images provided by Visit Noosa, Claire Plush, and Daniel Hine. Editor's note: This article is proudly sponsored by Visit Noosa and endorsed by The Urban List. Thank you for supporting the sponsors who make The Urban List possible. Click here for more information on our editorial policy.